Innovative studies and advanced learning methods aiming to improve study quality is one of the main priorities of Kaunas University of Technology (KTU). The University is actively participating in various networks, sharing knowledge and good practice with its partners. 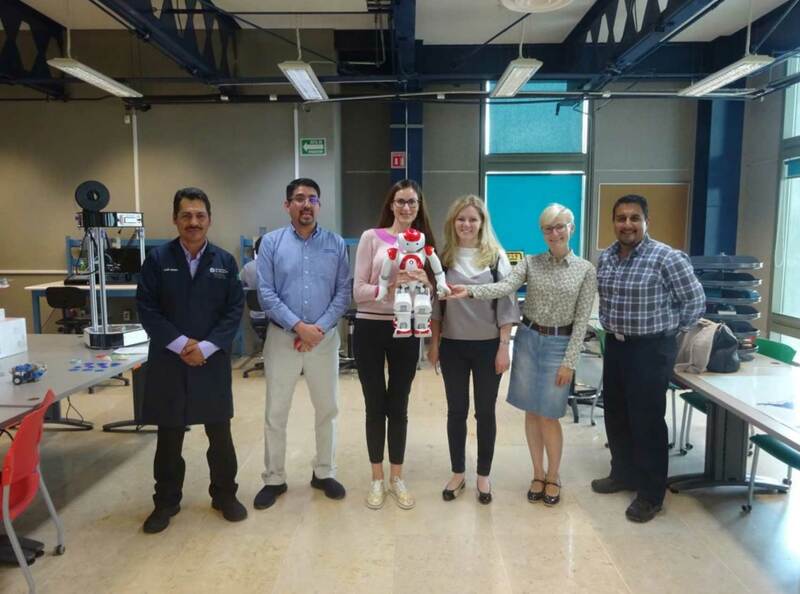 In the end of September, the representatives of the Study Office visited Tecnológico de Monterrey (Monterrey Institute of Technology and Higher Education), Mexico for a close-up look into their innovative study model Tec21. By introducing Tec21 study model of challenged-based learning Tecnológico de Monterrey aims to meet the requirements of a contemporary student and the ever-changing job market. Challenge-based learning is focused not only on the knowledge and competences specific to a certain discipline, but also on developing interdisciplinary competences and transferable skills, such as creativity, entrepreneurship, communication and team-working skills. Tec21 study model means solving issues of various complexity and duration during all study period, tackling real-life market issues, collaborating with various professionals and business companies. “The aim of our visit was to look closely into the innovative challenge-based study model applied in Monterrey, to learn from good practice. As Tecnológico de Monterrey’s Tec21 is similar to product development course that we are implementing at KTU, we wanted to see how it works there. Tec21 is an original study module, which was created by the Monterrey Institute of Technology after extensive consultations and collaboration with European and American universities”, says Jurgita Vizgirdaitė, Director of Department of Study Quality Assurance and Development at KTU. Founded in 1943 and ranked 178 in QS World University Rankings, Monterrey Institute of Technology and Higher Education successfully blends tradition and contemporary achievements. 64 thousand students and 9.7 thousand teachers work in the university. KTU and Tecnológico de Monterrey are partners in the European Consortium of Innovative Universities (ECIU). Kristina Ukvalbergienė, KTU Study Management Director is convinced that the good practice exchange visits are extremely beneficial for both sides: “It was very useful to see how the university is organising this type of studies, how the classes are planned, what methods the teachers use, what help and tools are being offered by the university. At KTU we are keeping up with the global trends, we are always looking for new contemporary teacher training methods; I am convinced that the close look at Monterrey Institute of Technology and Higher Education will help us to develop even further”. While studying under Tec21 study model the students of Tecnológico de Monterrey are solving various challenges in interdisciplinary teams, they can apply theoretical knowledge obtained during lectures. Solving various challenges requires close cooperation between students and teachers from different faculties and study programmes. The students are motivated not only by team work and cooperation with business enterprises and social partners of the university, but also by competing with other student teams. Challenge-solving activities can take iWeek and iSemester format. From 2019, the students of Tecnológico de Monterrey will have 2 iWeek cycles in an academic year (6 weeks in total during the period of studies). Three iWeeks are devoted to challenge solving and the other three – to sports, social and other activities. During the iWeek students do not have lectures, they fully commit to challenge solving and their aim is to choose one of the challenges proposed by teachers. Students from various study programmes, working together with representatives of business and non-profit companies have to offer a solution, such as social innovation, prototype or a product. During iSemester the students are solving real problems from business or industry during the length of a semester while cooperating with representatives of companies or organisations. Challenge-based learning is useful not only for preparing specialists who are best answering the needs of the job market; the Monterrey Institute of Technology and Higher Education is aiming for their graduates to understand the importance of social responsibility and community spirit, to be responsible, business-minded and creative members of society. That’s why the students are encouraged to take part in various social activities. “The representatives of Tecnológico de Monterrey told us that through challenges the students are also gaining social competences. For example, during their studies the students are travelling to the remote villages in mountains where they read lectures and workshops on entrepreneurship for the locals, so as the people could turn their traditional crafts or cultural heritage products into profitable activities”, explains Vizgirdaitė. During the visit KTU and Tecnológico de Monterrey representatives have discussed their closer cooperation possibilities. Two students from Monterrey are planning to come to study to KTU, several KTU teachers and scientists have participated in mobility activities. KTU and Monterrey Institute of Technology and Higher Education are implementing Twin study programme in Mechanical Engineering; cooperation in Twin programme in Communication is being discussed.